Spanish songs with texts based on Scripture that bring consolation and hope in times of grief, loss or mourning. This is the CD for the collection Todo lo Podemos en Dios. Find all the music from Todo lo Podemos en Dios in this MP3 Album. This is the guitar songbook for the collection Todo Lo Podemos en Dios. Through life, we sometimes encounter difficult times and life-changing situations that we could hardly ever imagine. It is not uncommon that during these tragedies and transitions, we doubt the reasons of God. However, it is through love and faith in God that we can find strength and resilience to carry on. 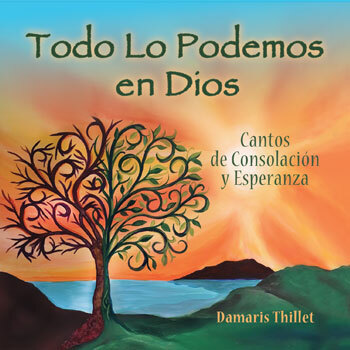 When composer Damaris Thillet’s husband, Diego Correa, passed away, she used music to carry her through the grieving process, get closer to God and honor the memory of her husband. Todo Lo Podemos en Dios is comprised of 8 songs— some of them written by both Diego and Damaris, and others composed by Damaris, to provide consolation to people and communities facing hardship. The collection is influenced by the rhythms and enthusiasm of her home, Puerto Rico, as well as contemporary styles to radiate encouragement and a newfound joy. The song “Todo Lo Podemos en Dios,” with its captivating melody, stirs us to place our trust in the Lord who will sustain us. At the same time, songs such as “Que Brille Sobre Nosotros” and “Maravilloso Eres Tú, Señor” not only capture Damaris’s missionary spirit, but also convey a message of inspiration and hope that unites hearts in an expression of longing for the calm after the storm. The voice of their son, Joel Correa, is present in “Que Resuene Su Alabanza” and “Tú, Mi Buen Pastor,” which he and his father wrote music for; as well as "Somos Pueblo Misionero," which inspires and lights the path of the V National Encuentro of Hispanic/Latino Ministry. Grief and loss are common, however, Todo Lo Podemos en Dios captures a new perspective for these life experiences. As we listen to the collection, we discover a new way of Jesus Christ presenting Himself in our lives, transforming pain into joy and strength, giving us the hope of a rebirth to continue his work and become instruments of His love.